The group settles into formation meters after leaving the café. Like the table manners learned as children the formation is innate to us. Two abreast, tight against the curb we form two lines. Cars pass us with ease as we pedal out of town and into the countryside. The pair on the front increases the tempo as soon as we are out of traffic and onto the rural roads. From experience they quickly find the rhythm of the group. On the rural roads, we’re in synch. Knowing how to ride properly in a group is taught and learned. I was introduced to cycling as a boy. On my first group rides, I was taught how to ride with others appropriately. As we pedalled along with our club mates, my father explained ride etiquette to me. On open roads, the group stays close to the shoulder. To allow cars to pass and to benefit from the riders’ slipstream, the group stays compact. It is often easier for cars to pass a group of cyclists who are riding two abreast near the road’s shoulder than a group, which is single file and much longer. We must be aware we are sharing the road with other traffic. Each pair pulls off the front sharing the workload with the others. To peel off the rider on the right moves right, the rider on the left moves left, reducing their speed gently to let the others pass. The pair who has been following slice through the pair to take the lead with the rest of the group in their slipstream. The two who have just finished their turn on the front, move back into the slipstream at the back of group rapidly to avoid being in the way of the traffic for long. Within the group riders should always be paired up. Two abreast is acceptable, three is not. In an odd numbered group, the single rider sits at the back. Each rider has his or her turn being alone at the tail-end. In a group, everything is shared. A group is concerned with others’ well being. We point out obstacles in the road, we signal directions and we take care of each other. A rider who is struggling is sheltered from the wind and given food and drink. We wait for those who have punctured and help them repair the flat. Every cyclist has a bad day. A group will get you through the bad moments. Like bragging at a dinner party about wealth, nobody appreciates a rider who constantly forces the pace to prove his strength. Half-wheeling, the term used to describe a rider who is constantly pushing the pace half a wheel in front of the others, is an insult not a compliment. 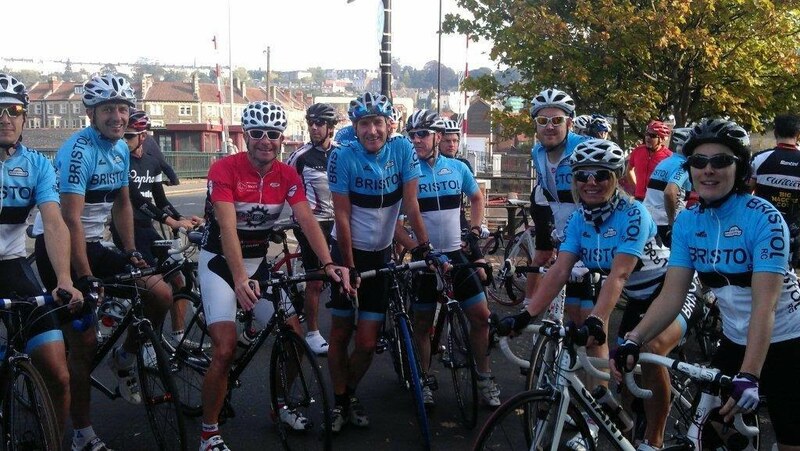 Group rides are not races. Good riders are in tune with each others’ abilities and the groups’ objective. At the right moment, when everybody is ready, the tempo will increase, the group will splinter, the strongest will surge ahead, and then only to regroup again at a designated spot. A group ride should be challenging but also pleasant. Experiencing an achievement is often richer when shared. On the bike, each pair of riders converses as if they’re across from each other at a dinner table but in the fresh air the conversation is often more animated. On the roads, societal hierarchies are muted. A CEO is just another wheel to follow. A professional cyclist is just another face glistening sweat. Together, a group of eight eats through the hours. In nearly six hours, we’ve seamlessly devoured mountains, cut through valleys and popped through towns. Even our stop at a café failed to break our rhythm. On the terrace, everything continued to flow. Well said Michael. The well-being of the group should always be paramount. Thanks for that…reads like a plan for life! Excellent. There’s not enough cycling etiquette on today’s roads. Well-written, as always – informative, economical and entertaining. It’s as much a pleasure to read you as it is to ride with you. Grazie, Sr. Barry. Nicely spoken, Mike. Really enjoy following your career. You do us proud. Lovely post. Poetic. Beautiful. Makes me wish I were faster and able to climb anything more than a low train overpass. So true, the hours and kilometers go by so much smoother. It’s a world of difference, to ride with a well disciplined group, than with a bunch of people that are all over the road. Wish it was obligatory to train people how to ride. Let them read your postings! I am sure even the old and hardened Zoo Crew guys will appreciate this fine bit of writing about group road riding. Bravo! Beautifully written! I felt as though I was along for the ride, enjoying every moment Thank you for explaining proper group ride etiquette. Very true. There isn’t much that looks better than a well drilled club run trotting through the country lanes. A few weeks ago We had a guy leap out of his car with a camera and start snapping away as rolled past! Great read! Even inspirational. I want to go for a ride now! Sounds like the Donut Run! Great writing as always Michael, also great to see you have signed with Sky for another year to keep the Canadian presence in the European peloton alive. Bravo! Le Métier is such a beautiful read. You have successfully captured this beautiful sport. BTW, I proudly ride my Mariposa in South Carolina. Never seen another down here. Hope your dad is well. Thank you Michael… Your writing reminds me of these now fall rides with sun shining past the spaces left by fallen leaves and blocked by the yellow fading leaves still waiting to. Great piece. Makes me want to drop what I’m doing an go ride. Although I ride solo more often than not, the camaraderie and feeling that everything is “right” in a well tuned group ride is always so rewarding. Michael, good read ~ do you mind if I copy it across ( with all credits to you and Sky ) to our club magazine Seamons CC? Great post! Sums up everything that’s both immediate and transcendent about riding in a Group. Can’t wait for the morning Ride. Best of luck next season! Lot’s can be learn’t from the article. Hope all my club mates will read this and take something from it. Perfect timing, time of year for LSD Group Rides, thanks! Hey Michael, Abi and I were thinking we should print this out and hand to folks on the Donut ride. Best of luck next year and enjoy the holidays.